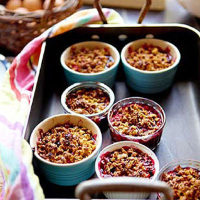 If you make these in individual cups, the kids’ crumbles can be cooked first and the uncooked adult ones can be popped in the oven when needed. If you’d rather not go near the oven again, spoonfuls of cooled crumble can be layered in glasses with a mixture of whipped cream and greek yogurt, sweetened with a touch of sugar. Preheat the oven to 180C/gas 4. Mix the berries with 50g sugar and the vanilla extract and pile into a medium gratin dish or six ramekins or ovenproof cups. Mix the granola with the melted butter and remaining 10g sugar and sprinkle evenly over the fruit. Bake for 15-20 minutes, depending on size, until bubbling.